Excuse a slight departure from the normal subject of this blog. So I've just got a brand new XPS13 (i7-7500U CPU @ 2.70 GHz - Aug 16) - a lovely machine if you want something ultra portable. I specially bought the 512GB version so that I could comfortably install Linux to dual boot with the pre-installed Windows 10. (Btw you do have the option of buying the developer edition which comes pre-installed with Ubuntu but I wanted both Windows and Ubuntu and reckoned it was easier doing it this way round). prepare your Linux distro on a USB - I used Ubuntu 16.04.
shrink your drive by the required amount for your Ubuntu distribution. Restart the machine and press F12 when you see the Dell logo. You will be able to go to 'bios settings'. In the bios settings go General -> Advanced Boot Options and click on 'Enable UEFI Network Stack'. Save and Exit. Make sure you have your flash drive in your machine at this point and reenter the bios settings. This time go to General -> Boot Sequence click on 'Add Boot Option'. Enter Ubuntu as the 'Boot Option Name' and then in 'File Name' click on EFI/boot/grub64. You will see a new entry at the top of the screen under Windows Boot Manager called ubuntu. Change the order so that Ubuntu is called before Windows Boot Manager. 'Apply' and save your settings and then Exit. When the machine reboots you change be presented with the Grub menu where you can install Ubuntu as per the rest of the instructions in the video. Once Ubuntu is installed you can reboot and choose whether to go into windows or ubuntu as you would in a normal dual boot environment. One thing you will notice is that the screen size resolution on Ubuntu is pretty tiny so you might want to change the screen display 2048x1152 before continuing. These set of posts should be useful for anyone responsible for creating or benchmarking real Java applications. As well as introducing the open source JLBH benchmarking harness we go into some of the subtleties that underpin latency benchmarking in Java with real code examples. Understanding that you have to drop throughput to achieve good latencies at high percentiles. As mentioned in the Introduction to JLBH the primary reason JLBH was created was to measure the Chronicle-FIX engine. We use all the features of JLBH, particularly the throughput lever and the accounting for coordinated omission to get some realistic timings for QuickFIX. Later in this article we will look at some results for ChronicleFIX but first let's look at benchmarking QuickFix the open source implementation of a Fix Engine. The client creates a NewOrderSingle which is then passed to the server. The server creates an ExecutionReport which is send back to the client. End to end time is measured from when the client starts creating the NewOrderSingle to when the client receives the ExecutionReport. Note: We need to keep the start time that the benchmark was called with right the the program. In order to do this we use a trick and set the start time to the tag ClOrdId. If you want to get the benchmark running on your servers you should clone this GitHub repo all jars and configurations files are set up there. For the sake of this post here's the code for the benchmark. These are the results that I see running on my server Intel(R) Xeon(R) CPU E5-2650 v2 @ 2.60GHz. The mean here is ~200us but as you up through the percentiles the latencies really begin to degrade. A lot of this is due to the amount of garbage that is being created! You can see this by running the benchmark with the jvm flag -verbosegc. Note that the latencies for 10k/s are slightly better than at 2k/s. This is rather counter intuitive as we would expect latencies to increase as throughput increases, for example as we find with the 50k run below where the latencies are much worse. The explanation for the 10k / 2k discrepancy is that as throughput increases the CPU caches and other resources can stay hotter and therefore, up to a point, latencies actually get better as throughput increases. This is another reason why it is so important to measure your latencies at a realistic throughput for your application. In fact when you up the throughput to 50,000/s even your 90th percentile (1 in every 10 iterations) is completely blown and you end up with multi millisecond delays. The issues here are not just the mean time (assuming that ~200us is too slow for you) but even more worryingly the way the numbers degrade as throughput is raised and as you study the higher percentiles. Let's compare this Chronicle-FIX. The test is run for exactly the same scenario and on the same machine. 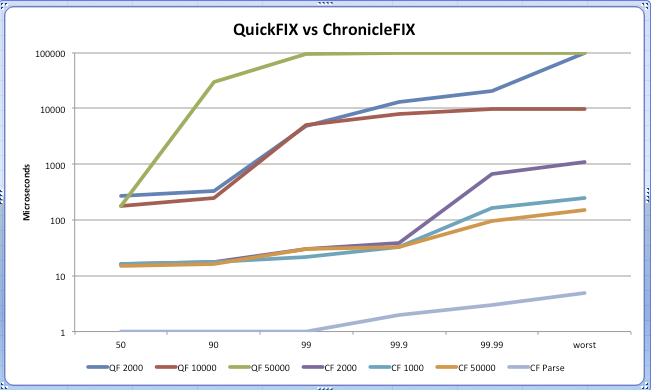 The Chronicle-FIX mean is around 16us which is 12 times faster than QuickFIX. But it's more than that because nearly all that time is in the TCP round trip. When you measure the TCP time (see last post JLBH Examples 3 - The Affects of Throughput on Latency) it turns out that most of that time is TCP ~10us. And as has been demonstrated if you care about your upper percentiles than it get much worse than that. For completeness it should be noted that that the server this was benchmarked on was reasonably noisy. It had latency spikes of around 400us which accounts for the larger numbers that are shown up in the higher percentiles. Also this test uses loopback TCP which puts a huge stress on the Linux kernel. In fact strange things happen when you push the throughput up really high (you can try this with the simple TCP test) - so this is not the best way to test Chronicle-FIX. It is only used as a comparison against Quick FIX. In the post we saw the effects of accounting for coordinated omission or measuring the effect a delay to one iteration will have an affect on subsequent iterations. Intuitively we understand that throughput will affect latency. It seems natural that as we raise throughput we will also raise latency. Going into a very crowded shop will affect how fast you can select and purchase your goods. On the other hand consider a very rarely frequented shop. It could be that in such a shop the shopkeeper is away from the till having a tea break and that your purchase will be delayed as you wait for him to put down his cup of tea and make his way to the counter where he can server you. This is exactly what you find when running benchmarks and vary throughput. In general as you raise throughput latency increases but at some point when throughput drops below a certain threshold latency can increase as well. The code below times a round trip TCP call over loopback. These probes do not take into account co-ordinated omission - it is only the end to end time that takes coordinated omission into account. If that was all you were measuring you might say that there would be no problem running 20k/s messages through my machine. However my laptop clearly can't handle this volume and if we look at the second run again for the 90th percentile. So we see that if you want to achieve low latencies at the high percentiles you have to drop your throughput to the correct level. This is why it so important that we are able to vary throughputs with JLBH. Let's imagine you are waiting for a train and get delayed in the station for an hour because the train in front of you was late. Let's then imagine you get on the train an hour late and the train takes it's usual half an hour to reach it's destination. If you don't account for coordinated omission you will not consider yourself to have suffered any delay as your journey took exactly the correct amount of time even though you waited for an hour at the station before departing! But that's exactly what you do when you run a micro benchmark. You time each 'journey' and not the waiting time. And the truth is, that's absolutely fine for a micro benchmark. But it is not fine when you want to measure the latency of an application. By default JLBH measures end to end times accounting for coordinated omission although you do have a setting to measure it without accounting for coordinated omission. I wrote this simple benchmark to show just how dramatic an effect accounting for coordinated omission can have. If you set coordinatedOmission(false) then you get this profile - as expected the millisecond delay can only be seen on the highest percentiles, from the 99.99th percentile upwards. Or put it this way it only affects one in every 10k iterations - not really surprising. But if you set coordinatedOmission(true)you see the true effect of this delay. In fact one in a hundred (not one in 10,000) iterations are affected to some degree. You can also see the progressive effect of the latency as you head up the percentiles. This clearly demonstrates in numbers why coordinated omission must be a significant part of your benchmarking, especially if you can't exert flow control in your program. Flow control is the ability to stop consuming if you are not keeping up e.g. bumping users off your site if you are too busy. Fix Engines can not exert flow control i.e. you can't tell the market to slow down because you can't keep up! Programs that exert flow control are consumer centric whilst programs don't exert flow control are producer centric. Accounting for co-ordinated omission goes hand in hand in hand with being able to set latency for a defined throughput which is something we will look at in the next example.